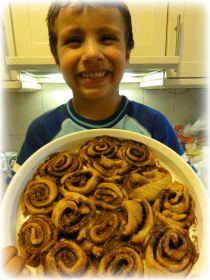 Kids love to help with making and eating these fantastic Cinnamon swirls. Our 4 year old makes these cinnamon buns virtually on his own. He calls them his 'swirlies'. We all love this snack, and they are so tasty that they hardly ever last to the end of the day--and that is when we make a double portion! This is a quick cinnamon bun recipe that takes 15 minutes prep time and 12 minutes to bake in the oven. A nice cream cheese frosting, adds a little extra sweetness. We will show you the 4 steps needed to prepare these great 'swirlie' snacks. Enjoy this cinnamon bun recipe as a treat for the whole family. Combine all 'wet' ingredients into a mixing bowl. Cream the butter and sugar, then add the seasoning and mix well. This cinnamon bun recipe is quick and easy to make and everyone will love to help in eating them. We make this recipe at least every other week with our youngest boys at 2 and 4 yrs old helping to make them--and it still only takes 15 minutes! With or without frosting, as a desert, snack or party sweet. 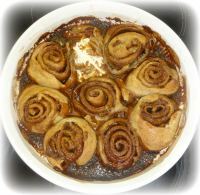 You, your family & friends will love these cinnamon swirls.